Working on 24” to 60”, 4 and 8 harness looms in a well-equipped facility, create items of lasting beauty. Experience the Life of the Weaver: 3 day intensive will give insight into the many facets of weaving , three days of shuttle throwing madness, learn the steps of dressing the loom then continue to weave a Lap throw, overshot table runner and another project (scarf , shawl, rag rug or bound weave sampler) of your choosing time providing. Whether you continue on to become an emerging weaver or just want the experience to enhance creative spirit you will always have your creations to bring you fulfillment. “ Experience the life of the Weaver”). Up to 40 hours of creative production weaving to be completed over a 2 month span. Times are flexible during Academy open hours. Working with me on my process exploring different weave structures and production techniques. You will also complete projects of lasting beauty that you may keep. As Weaving has many facets, each having a considerable learning curve this is designed to help you find your direction. Weaving Warrior : I have what it takes – 5 day intensive, for the strong of heart. Loom dressing and completion of as many projects as you can in 5 days. Working on already dressed looms make useful items in many different weave structures. Explore warp design and weft designing as you go. Program designed to promote production weaving and at loom attention span. Immediate gratification guaranteed. Not recommended as a beginning program, but if you want the challenge I will only encourage you, it’s how I learned. 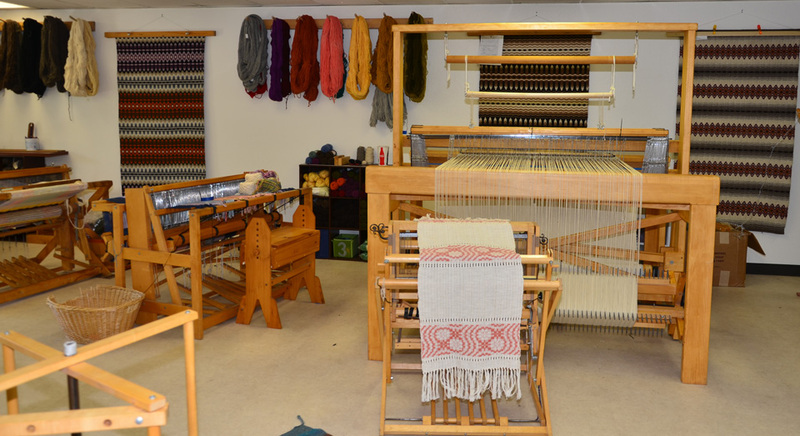 The Weaving Dream: Have you ever wondered what it would be like to create cloth? After I wove my first piece I felt that I could do anything. We are offering a dreamlike experience, an overnight in the Weavers Casita (optional) and the next day weave a shawl or throw on a loom ready for your fiber expression. A piece that you can use with pride, and a memory that will last a lifetime. This is designed for those who want a unique and rewarding experience. Check out the optional Casita rental here. Fiber Play: Check calendar for dates: Join with mountain fiberholics to Knit, Spin, crochet, weave and share knowledge and inspirations. A time to bring out unfinished projects or start new ones. Meet new friends and reconnect with old ones, we can learn so much from this type of sharing and leave inspired. Looms, equipment and supplies provided. Be sure make time for the historical charms of the area as well as the many galleries, shops and restaurants.